Experience the element of surprise with our Scentsy Whiff Box, to introduce you to a variety of products! Every month, we’ll curate a new assortment of Scentsy fragrances and product lines — a Whiff Box — designed to entice you to experience new, trending and seasonal items. What’s In The Whiff Box? Each Scentsy Whiff Box will include five to eight sample- and full-size consumable products (aka the stuff that runs out). You can always expect Scentsy wax in single-use cups and/or a Scentsy Bar or two. The remaining contents will vary depending on the products available in your country, either from Scentsy Laundry, Clean, Body or on-the-go products. Contents will arrive in a unique Scentsy-branded package with a seasonal note about the assortment and an exclusive “sniff preview” of the next Scent of the Month! How Often Can You Get a Whiff Box? 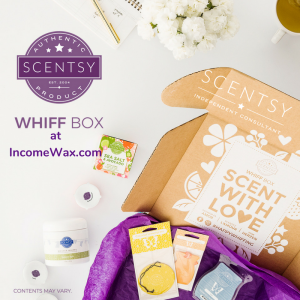 You can order a Scentsy Whiff Box as a one-time purchase through www.IncomeWax.com or you can receive it as often as you’d like by adding it to your Scentsy Club subscription! To learn more about Scentsy Club, click here. How Much Does a Scentsy Whiff Box Cost? Each Scentsy Whiff Box is $30 (USD)/$40 (CAD). Products included are discounted by roughly 15 percent of their individual retail price, making it a most fragrant value. Order a Scentsy Whiff box (or two) here. What is a Scentsy Whiff Box? Scentsy Whiff Box is a monthly hand-picked assortment of Scentsy fragrances and product lines designed to entice you to experience new, trending and seasonal items. Every month’s assortment is a fun surprise! What can I expect to get in a Scentsy Whiff Box? You can expect five to eight sample and full-size consumable items (aka the stuff that runs out) in each box. You’ll always get Scentsy wax in single-use samples and/or a Scentsy Bar or two. The remaining contents will vary depending on items available in your country, either from Scentsy Laundry, Clean, Body or on-the-go products. A Scentsy Whiff Box will arrive in a unique Scentsy-branded package containing a product information insert and a “sniff preview” of the next Scent of the Month! How are the contents of a Scentsy Whiff Box selected? Scentsy Whiff Box contents are carefully curated by our team of fragrance experts at the Scentsy home office. Selections represent a variety of new, on-trend and seasonal items. How often do the contents of a Scentsy Whiff Box change? Scentsy Whiff Box contents change monthly to incorporate the latest trends and seasonal fragrances. Products are subject to change throughout the month due to availability. If products sell out, they will always be replaced with comparable items. Am I able to customize the contents of a Scentsy Whiff Box before I order? When will the contents of a Scentsy Whiff Box be shared? 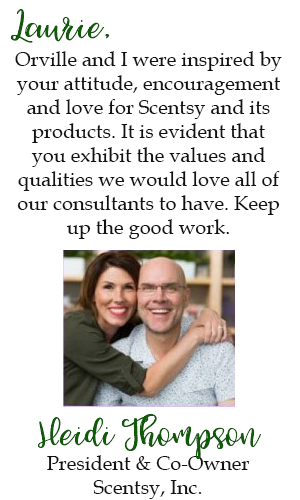 We share the product lines you might expect to see in a Scentsy Whiff Box, but to maintain the element of surprise for customers, specific contents for current and future months will not be published. As the month develops, social sharing may begin to indicate the month’s curated contents, but keep in mind that contents are subject to change due to product availability throughout the month. To maintain the element of surprise for customers and respond quickly to product availability changes, Scentsy Whiff Box contents for current and future months are not published. The contents of the previous month’s box will be posted on the Scentsy Whiff Box product page of my website, www.IncomeWax.com at the beginning of each new month. This will give you an idea of the types of products you can expect to receive in a Scentsy Whiff Box. Why were the contents of my Scentsy Whiff Box different than someone else’s? Scentsy Whiff Box contents are always subject to availability, and because products occasionally sell out, there may be variances within a box for a given month. If an item sells out, it will always be replaced with a similar product of equal value. Scentsy Whiff Box contents will also vary by country given that not all product lines are available in all countries. How is Scentsy Whiff Box sold? You can order Scentsy Whiff Box as a one-time purchase, or a party order, through my website, www.IncomeWax.com — or you can receive a new Scentsy Whiff Box as often as you’d like by adding it to your Scentsy Club subscription! How do I make Scentsy Whiff Box auto-ship each month? This service is available only through a Scentsy Club subscription. 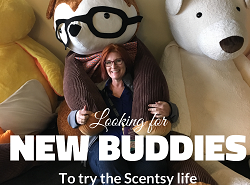 Scentsy Club members can schedule recurring shipments of Scentsy Whiff Box — every month, two months or three months — to continue trying the latest Scentsy products on a regular basis. Did you know? At $30 USD/$40 CAD retail, Scentsy Whiff Box automatically qualifies you for reduced shipping on Scentsy Club subscription orders! Send a whiff box as a gift, or add it as a monthly Scentsy club subscription to your loved ones who are at university or living elsewhere.